An old Irish legend tells of the hero, ChÃº Chulainn, who gathered 10 brave men together to drive the enemy from their land in a great battle. After returning home, he gave each of his followers a magic amulet. Each amulet was similar: the 9 outer parts were identical, but the middle part of each was different, making it possible to distinguish one from the other. The amulets brought their owners and their offspring respect and wealth. When the Vikings conquered the land, they destroyed the amulets, scattering the parts of each throughout the land. The players take the roles of adventurers in 11th century Ireland, who seek to recover the parts of the amulets and put them back together. Five druids have pledged to help you in your endeavor. 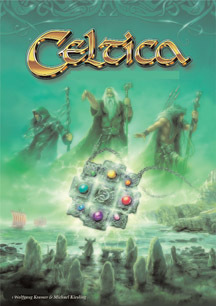 The player who finds parts and puts together the most amulets will win the game and become the new Celtic king!